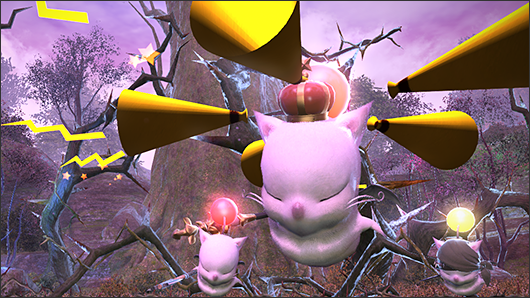 GameGeex - Final Fantasy XIV: A Realm Reborn 2.1 patch notes FFXIV's patch 2.1 is official out and the game has changed a ton for the better. Check out the patch notes here! 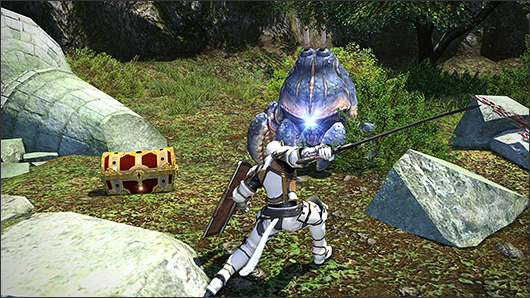 Final Fantasy XIV: A Realm Reborn's patch 2.1 is officially out and there is a lot to see. Some people are having difficulty accessing or finding the mammoth of a patch notes Square Enix put out so here it is, laid out and organized just for you guys. I warn you, it's a lot and will take more than one read to analyze everything. Click the jump below for the massive wall of text and numbers. Main scenario quests have been added. *For spoiler-free purpose, certain quest and NPC names are not available. Chronicles of a New Era quests have been added. Side story quests have been added. 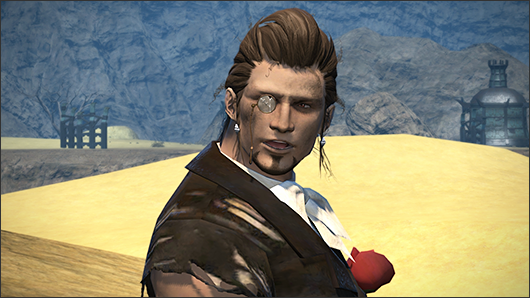 Grand Company quests have been added. Beast tribe quests have been added. 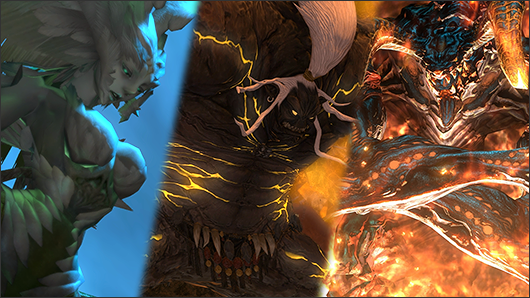 Beast tribe quests are episodic quests which can be accepted from friendly factions within the various beast tribes of Eorzea. The quests that are available change on a daily basis. By completing them, players can improve their reputation within those factions. Players can accept up to six quests in a single day. Quest objectives range from defeating enemies to gathering and delivering specified items. For your troubles, you will receive rewards such as EXP, gil, and Allagan tomestones. You will also improve your reputation within the issuing faction. At certain milestones, you will be given the opportunity to undertake a main beast tribe quest. *You must complete or cancel the daily beast tribe quest from the day before before you accept a new quest that day. 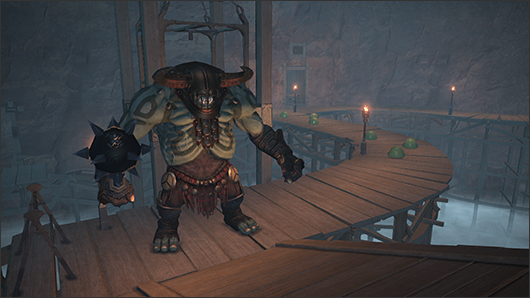 Main beast tribe quests are episodic quests that provide you with an insight into the lives of the beastmen. These quests become available when you have filled your reputation gauge at the current rank. Completing one raises your reputation to the next rank, and you will unlock more quests. Tribe vendors will also have a wider range of wares in stock. Each beast tribe faction has a vendor selling various goods. While these NPCs will not trade with you at first, as your reputation improves within the relevant faction, you will become able to purchase an ever-expanding array of items such as furnishings, minions, and mounts. EXP and gil received from battlecraft leves have been increased. The Armoury bonus will now apply to EXP received upon completing battlecraft leves. Completion bonuses received from battlecraft leves have been increased. New tradecraft leves have been added. New item rewards have been added to certain tradecraft leves. EXP awarded upon completing certain tradecraft leves has been increased. Bonus EXP awarded for handing in HQ items for tradecraft leves has been decreased. Gil awarded for completing fieldcraft leves has been increased. Shards awarded for completing fieldcraft leves have been increased. Additional rewards have been added for handing in HQ items for fishing fieldcraft leves. 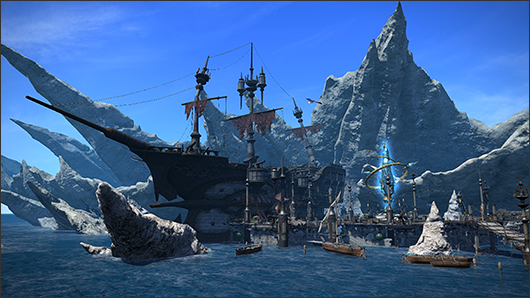 The EXP reward for completing certain fishing fieldcraft leves has been increased. Bonus EXP awarded for handing in HQ items for fishing fieldcraft leves has been decreased. When accepting multiple guildleves in quick succession, the animation will only play once. The leve completion window will now indicate the location of the issuing levemete. Efts and fire sprites that appear in the guildhest “Hero on the Halfshell” will no longer yield EXP. Bomb chars and bomb baronets that appear in the guildhest “Long Live the Queen” will no longer yield EXP. New FATEs have been added. Enemies and NPCs which are central to FATE objectives such as Odin and the behemoth will now have the highest display priority. New dungeons have been added. * See below for average item level requirements. The poison effect from Aiatar’s attacks can now be removed using the item antidote. Damage inflicted by the action Final Sting used by temple bees and dung wespes has been adjusted. The action Mortal Ray used by teratotaurs no longer affects pets. Boss encounter difficulty has been alleviated. The poison effect from Locksmith’s Gold Rush attack no longer affects pets. The burrs effect from Miser’s Mistress’s Burr Burrow and Hooked Burrs attacks no longer affect pets. Enemy HP and strength have been reduced. The number of enemies in the instance has been reduced. The number of Allagan tomestones of mythology received from the final boss has been reduced from 40 to 30. The time limit has been shortened from 120 minutes to 90 minutes. Following changes will be made to certain dungeons. Certain monsters will now drop gil. Items you can obtain from certain treasure chest will change. The Crystal Tower has been added. 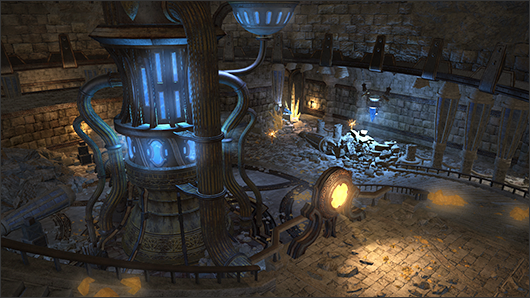 The Crystal Tower is an instanced dungeon designed for an alliance of 24 players. Patch 2.1 will see the addition of the Labyrinth of the Ancients, the tower’s outer perimeter. In order to facilitate the participation of three parties in the Labyrinth of the Ancients, a function has been implemented for forming an alliance. Upon entering a 24-player instanced dungeon, a list of alliance members will become available. * The position of the alliance list can be adjusted via the HUD Layout interface. The alliance list can be accessed from Party Members in the Social menu. The alliance chat mode will also be available. * The text command /alliance, /a can be used to switch to alliance chat. The position of alliance members is displayed on the map. Signs are shared between all alliance members to facilitate strategizing. The Labyrinth of the Ancients can be accessed via the Duty Finder when playing solo or in a party of eight players. 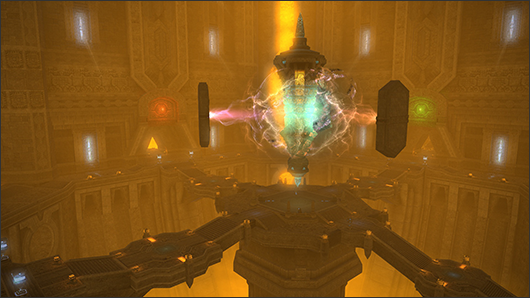 However, parties that enter the Crystal Tower must fulfill the requirements of two tanks, two healers, and four DPS. Please be aware that you cannot register for this duty if your party does not match this composition. Please note that three parties of eight cannot register for this duty together. Each party must register separately and be matched via the Duty Finder. You can receive only one reward item per week for completing duties in the Cystal Tower.In the event you are awarded an item from the loot list, you relinquish your right to vie for all remaining items regardless of whether you selected Need or Greed.In the event the time permitted in the instanced dungeon has expired, and a reward item is obtained automatically, this will also count toward the weekly one-reward limit. * Reward eligibility is reset every Tuesday at midnight (JST). Each party in the alliance will receive its own treasure chest, the contents of which will be identical for all parties regardless of the route taken. * Players cannot open a treasure chest belonging to another party. 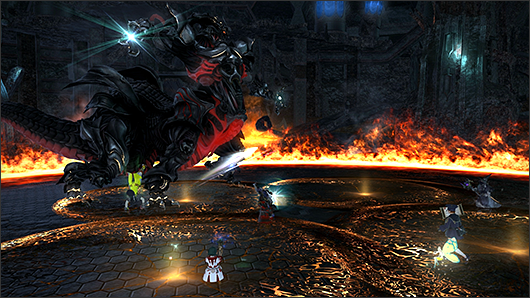 Extreme battles against Ifrit, Garuda, and Titan have been added. The new trial “Thornmarch” has been added. 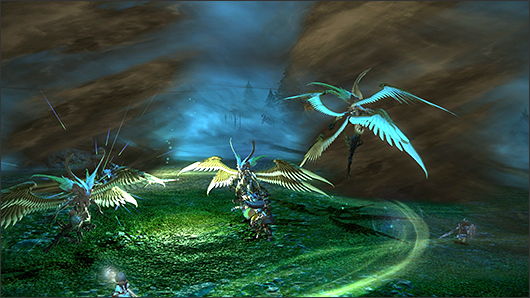 Aftter completing a certain quest, players will be able to enter Thornmarch to do battle against Good King Moggle Mog XII. 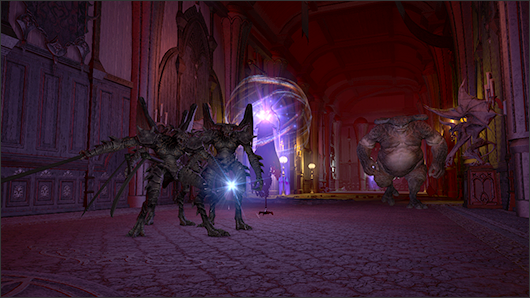 Players will receive unique rewards for defeating both the Good King and his Mogglesguard. 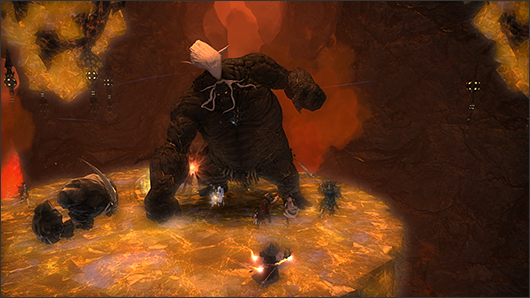 The new trial “The Minstrel’s Ballad: Ultima’s Bane” has been added. After completing a certain quest, players will be able to do battle once more against Ultima Weapon, which has been reimagined as a far more powerful opponent than before. Unique spoils await those who emerge triumphant. The time limit for the following trials has been reduced from 90 to 60 minutes. 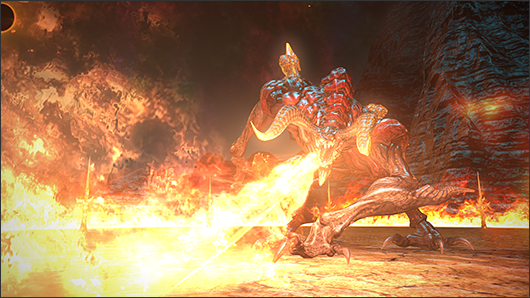 Damage inflicted by Ifrit’s Eruption in the Bowl of Embers (Hard) has been reduced. Average item level requirements have been instated for certain duties. Players who are continuously inactive for 10 minutes* in a duty will now be automatically expelled. * 3 minutes for the Wolves’ Den. The cooldown penalty for abandoning a duty has been increased from 15 to 30 minutes. * The above penalty does not apply when vote dismiss is used. *The cool down penalty will apply to the one who abandoned first. We are planning to implement the vote function to give up the content with no cool down penalty in patch 2.15. The weekly limit for Allagan tomestones of mythology has been increased from 300 to 450. The Wolves’ Den PvP arena has been added. 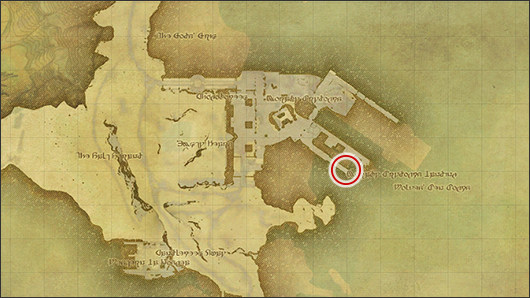 The Wolves’ Den can be accessed via the the ferry at Moraby Drydocks (X:32, Y:16) in Lower La Noscea. Matches in the Wolves’ Den have been divided into categories based on level and party matching preferences. 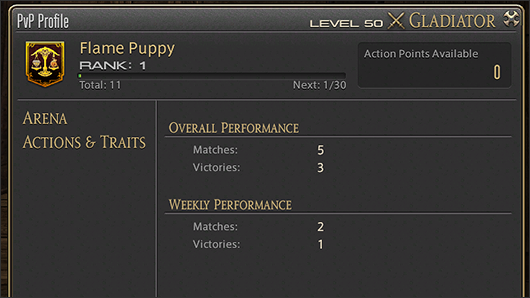 When registering for a match alone or in a preformed party, team composition must adhere to the requirements of one tank, one healer, and two DPS. Upon registering, players will be divided between one of two teams—the Fangs and the Claws. Players who exceed the designated level for an arena will be level synced. Both teams will be given two minutes to prepare before the match begins. 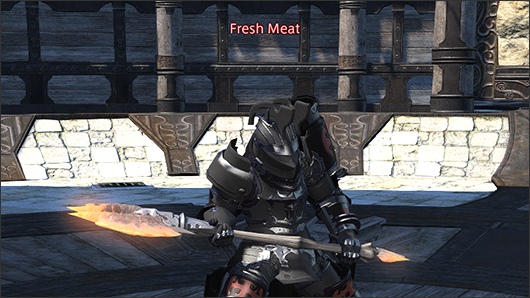 During the match, the title “Fresh Meat” will appear in place of character names. * Party members cannot be replaced during a match. Casting will always be interuppted upon receiving direct damage. Damage dealt by bows will vary depending on distance from the target. All class and job actions acquired as a Disciple of War or Magic can be used in the Wolves’ Den. In additional to normal actions, players can also learn PvP-exclusive actions and traits. These actions and traits can be purchased with Action Points (AP), which are earned by fighting in PvP battles. To view available PvP actions, select PvP Profile under Character in the main menu.AP can also be spent on enhancing the PvP actions and traits that you have learned. Additional effects gained will vary depending on skill. * By changing Grand Company allegiance, PvP actions obtained as a member of your former Grand Company will no longer be recognized. Cannot be cast on self. Enhanced Testudo: Shortens recast time to 180 seconds. Enhanced Testudo II: Extends duration to 16 seconds. Enhanced Glory Slash: Shortens recast time to 180 seconds. Enhanced Glory Slash: Increases potency to 200. Enhanced Mythril Tempest: Shortens recast time to 150 seconds. Enhanced Mythril Tempest II: Increases potency to 200. Thrill of War Increases maximum HP of self and nearby party members by 15% and restores HP by 15%. Enhanced Thrill of War: Shortens recast time to 180 seconds. Enhanced Thrill of War II: Extends duration to 25 seconds. Enhanced Thrill of War III: Increases HP increase and restoration to 25%. Full Swing Delivers an attack with a potency of 150. Enhanced Full Swing: Shortens recast time to 180 seconds. Enhanced Full Swing II: Increases duration to 25 seconds. Axe Kick Delivers an attack with a potency of 160 to all nearby enemies. Enhanced Axe Kick: Shortens recast time to 180 seconds. Enhanced Axe Kick II: Increases potency to 240. Somersault Delivers an attack with a potency of 160. Enhanced Somersault: Shortens recast time to 180 seconds. Enhanced Somersault II: Extends duration to 20 seconds. Enhanced Somersault III: Increases spell speed reduction to 50%. Fetter Ward Grants immunity to stun, sleep, bind, heavy, and disease. Enhanced Fetter Ward: Shortens recast time to 120 seconds. Impulse Rush Delivers an attack with a potency of 200. Enhanced Impulse Rush: Shortens recast time to 180 seconds. Enhanced Impulse Rush II: Extends duration to 20 seconds. Skewer Delivers an attack with a potency of 180. Enhanced Skewer: Shortens recast time to 150 seconds. Enhanced Skewer II: Extends duration to 20 seconds. Enhanced Skewer III: Increases INT reduction to 40%. Manasong Restores 25% of maximum MP for all nearby party members. Enhanced Manasong: Shortens recast time to 180 seconds. Farshot Delivers a ranged attack with a potency of 140. Potency is not affected by distance. Enhanced Farshot: Shortens recast time to 120 seconds. Enhanced Farshot II: Increases potency to 190. Enhanced Farshot III: Increases criticial hit rate by an additional 10%. Blast Shot Delivers an attack with a potency of 150 to target and enemies near it. Enhanced Blast Shot: Shortens recast time to 180 seconds. Enhanced Blast Shot II: Increases potency to 200. Enhanced Blast Shot III: Increases knockback distance to 15 yalms. Enhanced Sacred Prism: Shortens recast time to 180 seconds. Enhanced Sacred Prism II: Extends duration to 30 seconds. Divine Breath Resurrects target at 10% of maximum HP/MP/TP. Enhanced Divine Breath: Shortens recast time to 180 seconds. Enhanced Divine Breath II: Increases HP/MP/TP recovered to 50%. Enhanced Night Wing: Shortens recast time to 180 seconds. Phantom Dart Deals unaspected damage with a potency of 120. Enhanced Phantom Dart: Shortens recast time to 180 seconds. Enhanced Phantom Dart II: Increases potency to 180. Enhanced Phantom Dart III: Extends duration to 30 seconds. Misty Veil Reduces target’s range by 10%. Range cannot be reduced to less than 3 yalms. Enhanced Misty Veil: Shortens recast time to 180 seconds. Enhanced Misty Veil II: Extends duration to 25 seconds. Wither Deals unaspected damage with a potency of 170 to all enemies in a cone before you. Enhanced Wither: Shortens recast time to 180 seconds. Aura Blast Deals unaspected damage with a potency of 150 to all nearby enemies. Enhanced Aura Blast: Shortens recast time to 180 seconds. Enhanced Aura Blast II: Increases potency to 200. 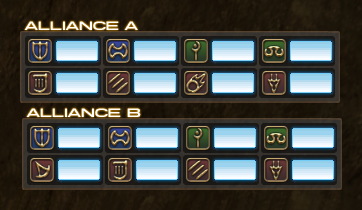 Focalization Increases nearby party members’ elemental resistances by 15%. Enhanced Focalization: Shortens recast time to 180 seconds. Enhanced Focalization II: Extends duration to 25 seconds. Enhanced Focalization III: Increases resistances to 25%. Weapon Throw Delivers a ranged attack with a potency of 50. Enhanced Weapon Throw: Shortens recast time to 60 seconds. Enhanced Weapon Throw II: Extends duration to 12 seconds. Enliven Instantly restores 50% TP. Enhanced Enliven: Shortens recast time to 180 seconds. Aetheric Burst Deals unaspected damage with a potency of 170 to all nearby enemies. Enhanced Aetheric Burst: Shortens recast time to 180 seconds. 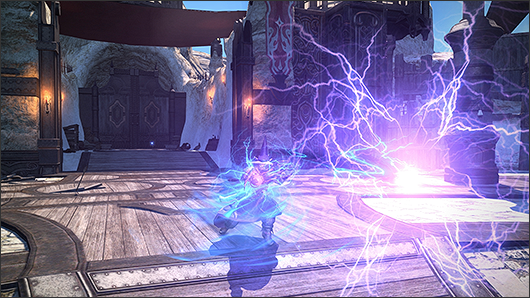 Enhanced Aetheric Burst II: Extends duration to 20 seconds. Equanimity Allows casting without interruption by attacks. Enhanced Equanimity: Shortens recast time to 300 seconds. Enhanced Equanimity II: Extends duration to 20 seconds. Mana Draw Restores 30% of maximum MP. Enhanced Mana Draw: Shortens recast time to 180 seconds. Purify Removes all detrimental effects. Can be used regardless of status affliction. Attunement Greatly enhances evasion while nullifying 90% of damage. Cannot move or act while in effect. Enhanced Strength (PvP) Increases strength by 4. Enhanced Strength II (PvP): Further increases strength by 8. Enhanced Strength III (PvP): Further increases strength by 13. Enhanced Dexterity (PvP) Increases dexterity by 4. Enhanced Dexterity II (PvP): Further increases dexterity by 8. Enhanced Dexterity III (PvP): Further increases dexterity by 13. Enhanced Vitality (PvP) Increases vitality by 4. Enhanced Vitality II (PvP): Further increases vitality by 8. Enhanced Vitality III (PvP): Further increases vitality by 13. Enhanced Intelligence (PvP) Increases intelligence by 4. Enhanced Intelligence II (PvP): Further increases intelligence by 8. Enhanced Intelligence III (PvP): Further increases intelligence by 13. Enhanced Mind (PvP) Increases mind by 4. Enhanced Mind II (PvP): Further increases mind by 8. Enhanced Mind III (PvP): Further increases mind by 13. Enhanced Piety (PvP) Increases piety by 4. Enhanced Piety II (PvP): Further increases piety by 8. Enhanced Piety III (PvP): Further increases piety by 13. A PvP category has been added to the Actions & Traits interface which lists all PvP actions learned. Highlighting the checkbox next to a desired skill will add the action to the list at the bottom of the Actions & Traits interface. Once an action has been added to the list, it can be dragged to your hotbar for use in PvP. * Players may equip up to 10 PvP actions at any given time. * The ? 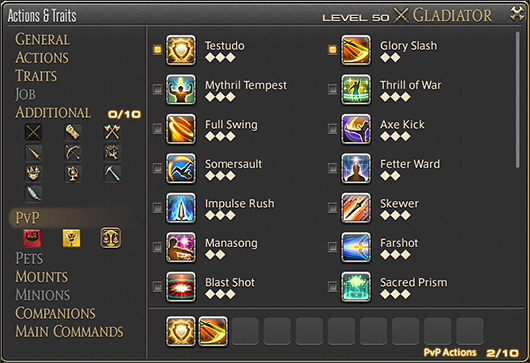 symbol displayed below PvP action names represents their enhancement status. All gear obtained from the Wolves’ Den will include a PvP-exclusive attribute known as morale. Morale comes into play only in level 50 matches, where it replaces physical and magical defense in influencing the damage you receive. Furthermore, morale also affects the amount of damage dealt to other players. PvP EXP: Earned by fighting in PvP. PVP Rank: Raised by accumulating PvP EXP. Action Points (AP): Received upon raising your PvP Rank. Used to learn PvP-exclusive actions and traits. Matches will end when all members of an opposing team have been KO’d. In the event that neither team is defeated within the allotted time, the match will end in a draw. 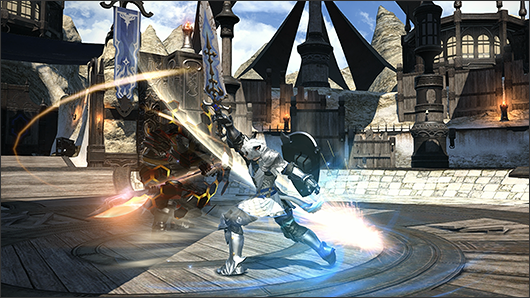 Fighting in PvP will garner players a special type of currency known as Wolf Marks, which can be exchanged for gear and materia that are tuned for PvP. The amount awarded is commensurate to performance. * PvP EXP and Wolf Marks are awarded even in the event of a draw or defeat. As players participate in matches in the Wolves’ Den, they will earn PvP EXP and rise in PvP rank. Each time you rank up, you will be granted action points. Certain ranks are also accompanied with a title. * PvP titles differ depending on your Grand Company. Additional titles will be added in future updates. PvP rank, PvP EXP and AP are all associated with the Grand Company you belong to. Once you switch to another Grand Company, they will become unavailable. Once you transfer to another Grand Company, you must work from a scratch. Once you return to the Grand Company you used to belong to, they will become available again. 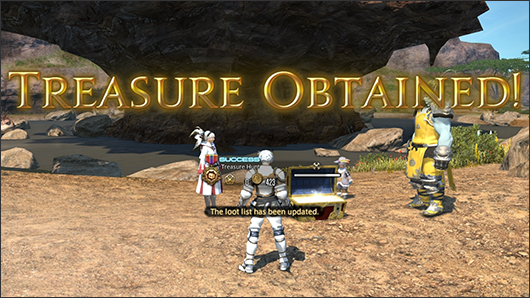 Treasure Hunt has been added. In the course of gathering, Disciples of the Land will now be able to obtain items known as timeworn maps. These maps can then be used to reveal the location of hidden treasures.Overview1. Obtaining a Timeworn MapUpon accessing gathering points at level 40 or above, Disciples of the Land will, on occasion, obtain a timeworn map. Upon accessing gathering points at level 40 or above, Disciples of the Land will, on occasion, obtain a timeworn map. Timeworn Leather Map: Level 40 mature trees, lush vegetation patches, mineral deposits, rocky outcrops, and fishing holes. Timeworn Goatskin Map: Level 45 mature trees, lush vegetation patches, mineral deposits, rocky outcrops, and fishing holes. Timeworn Peisteskin Map: Level 50 mature trees, lush vegetation patches, mineral deposits, rocky outcrops, and fishing holes (Lake Tahtotl, Parata’s Peace, and the North Shards only). * Timeworn maps cannot be found at unspoiled gathering points or guildleve gathering points. * Timeworn map locations are not be recorded in gathering and fishing logs. *Once you obtain any rank of timeworn map, then you will be unable to obtain new map for next 18 hours in earth time. 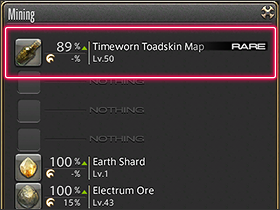 * Timeworn maps can be traded and sold on the market board. The contents of the treasure chest and the enemy that spawns will vary depending on the type of map. Actions Learned Decipher: Remove a timeworn map from its glass prison and unlock its mysteries. Dig: Locate and extract a treasure chest from the ground. Players can examine a timeworn map by using the action Decipher. Doing so will change the timeworn map into a treasure map key item. Only one treasure map can be in your possession at any given time. *All timeworn maps are unique. Using a treasure map will bring up a window indicating the general area of the treasure. Players must cross-reference the area map to discover its precise location. Using the action Dig in the approximate location will cause a treasure chest to spawn. 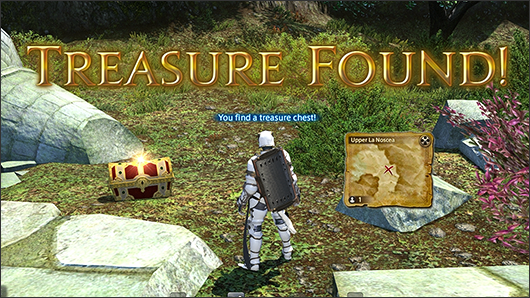 Treasure chests are armed with a trap, which, when triggered, will lure an enemy to your location. If the enemy cannot be defeated within the allotted time, or you and your party leave the area, the treasure chest will disappear and the hunt will end. * The treasure map will be lost upon triggering the trap. Players will be free to examine the treasure chest after defeating the abovementioned enemy. 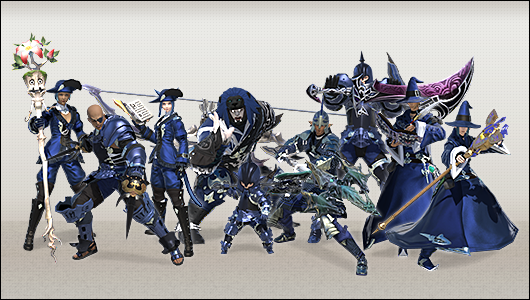 All party members will receive rewards such as EXP, gil, Allagan tomestones, elemental shards, and gear. 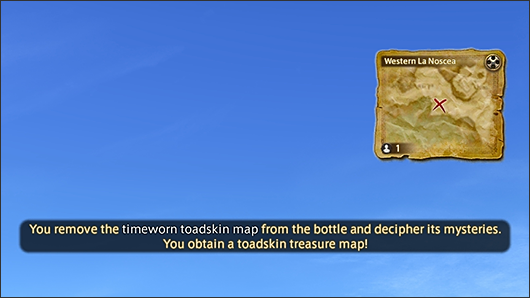 The contents of the treasure chest will vary depending on the type of treasure map. 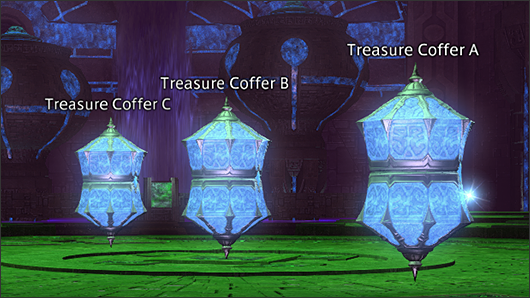 * Gil and Allagan tomestones will be distributed evenly between party members. A massive wall of text and numbers? That's my favorite kind of wall!